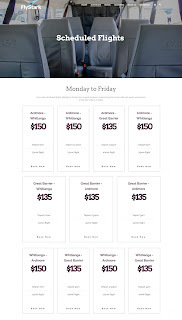 Described on its website as a little boutique airline operating in paradise FlyStark was formed as Stark Airlines Ltd on the 12th of March 2014 by Waikato businessman Ray Stark. He had previously purchased the Mercury Bay Aero Club's Cessna 172 ZK-CWD. In 2015 he started the process to obtain Part 135 certification authorising him to fly paying passengers. This was granted in October 2015 and FlyStark was born. 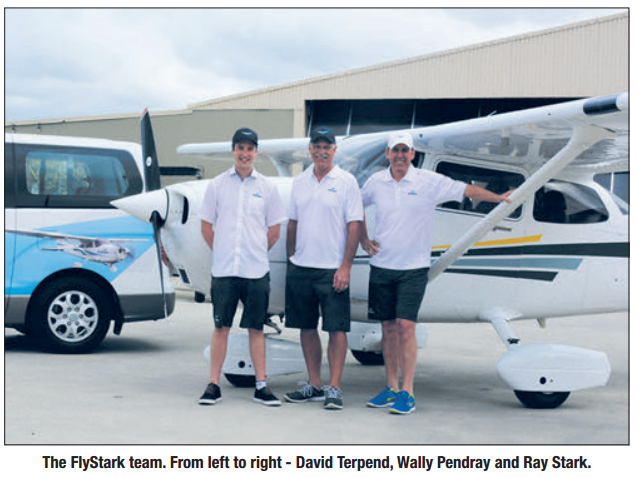 In October 2015 Ray Stark told The Mercury Bay Informer, “We’ll be available seven days a week at the Whitianga Airport for people to come out and go for scenic flights. We have a vehicle available at Ardmore Airport, which passengers going to Auckland can use themselves or they can be dropped off at wherever they have to be. We’ll be happy to fly anywhere our passengers want to go, including the west coast of the North Island. We’ll be targeting cruise ship passengers in Tauranga, bringing them to Whitianga for the day. We’ll also be targeting people living on Great Barrier Island to come to Whitianga for a day or a weekend and we hope to take people from Whitianga to the Barrier for a cup of coffee too. We’re also talking with local businesses like The Lost Spring about packages we can offer passengers from outside the area. Our big advantage is that we can fly whenever to wherever people want and we can do so at genuinely competitive rates.” Wally Pendray and David Terpend were employed as pilots for the new company. 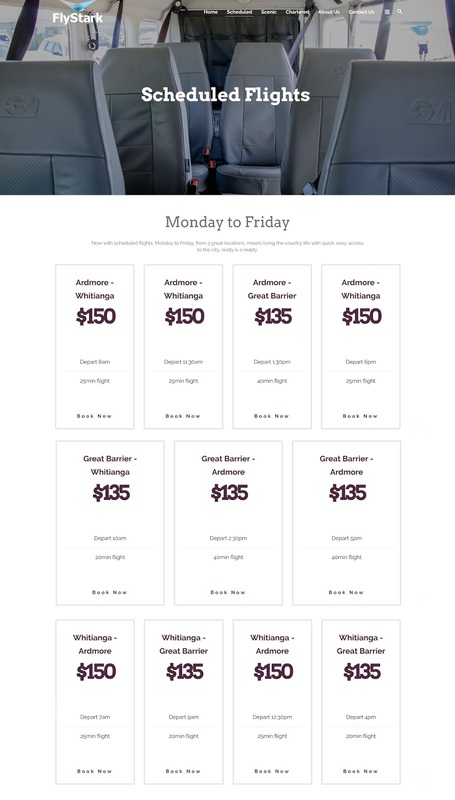 By December 2015 the company was advertising flights between Whitianga and Adrmore with a shuttle available to take passengers to Auckland International Airport or elsewhere in the city. A second Cessna 172, ZK-NPJ, was soon added to the fleet. In September 2016 a Gippsland GA8 Airvan, ZK-FSR, was purchased and from October 2016 the advertising a schedule of sorts was advertised with departures leaving Whitianga at 7.00am and departing Ardmore at 5.00pm. From 1 November 2016 FlyStark introduced scheduled daily early morning flights from Great Barrier Island to the mainland, returning to the Barrier every evening. The company also announced that it was looking to code-share with Barrier Air enabling passengers to connect with each airline's flights. 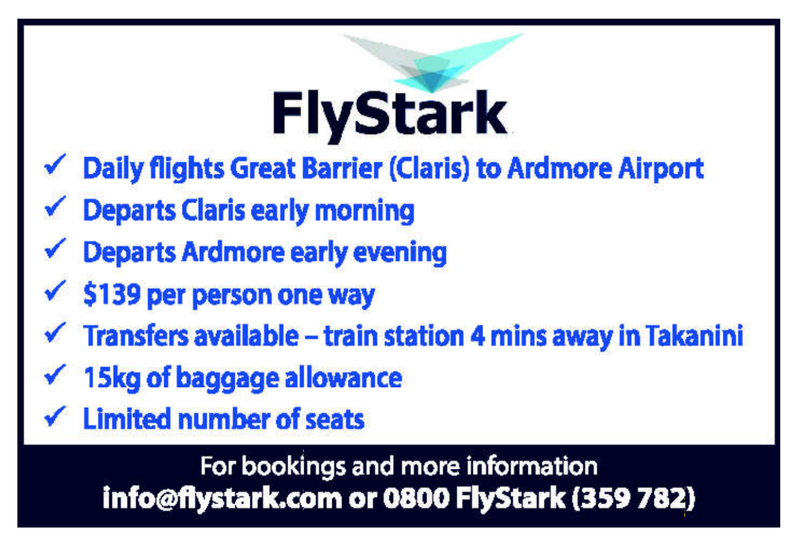 One of the features of the FlyStark service is that flights call in at Okiwi at no additional charge. In December 2016 FlyStark added a second Gippsland GA8 Airvan, ZK-FSS, to its fleet. The aircraft was previously owned by Tekapo-based Air Safaris as ZK-SAF. Over the 2016-17 summer scheduled flights were flights were offered between Whitianga, Ardmore and Great Barrier Island as well as additional charter flights. 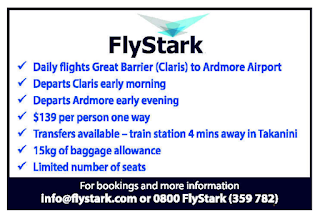 FlyStark's scheduled services were suspended from May 2016 over the winter months. A post on the company's Facebook page said, "this is mainly due around daylight hours and winter conditions. To provide a 100 % schedule service FlyStark believes it has to have the appropriate aircraft, while our existing aircraft are the latest available they do not have the capabilities to fly in adverse weather. We are taking time to review our current fleet for the coming season. The plan at this stage is to recommence our schedule flights as of 1st September." In May 2017 a post on the company's Facebook page announced, "that during the winter season commencing immediately FlyStark has suspended its scheduled flights. This is mainly due around daylight hours and winter conditions. To provide a 100 % schedule service FlyStark believes it has to have the appropriate aircraft, while our existing aircraft are the latest available they do not have the capabilities to fly in adverse weather. We are taking time to review our current fleet for the coming season. The plan at this stage is to recommence our schedule flights as of 1st September." Behind the scenes there is a story that has two sides. It appears that FlyStark was grounded following an incident when one of the Airvans came into contact with a hanger while taxiing. Neither the aircraft or hanger were damaged but nonetheless the aircraft was checked by an aircraft engineer and given clearance to fly. The other side of the story is CAA's answer to the question why it was necessary to suspend Whitianga operator FlyStark's operations for three months from May to July 2017. The Tauranga newsagency Sunlive reported CAA as saying, "The aircraft in question was a Gippsland GA-8. Wingtip damage requires a maintenance inspection before the next flight, yet FlyStark flew. The maintenance manual for that aircraft requires that any damage to the outboard wing area, regardless of how minor it may appear, must be inspected by a maintenance engineer before the next flight (see section 17 of the Civil Aviation Act). "For this reason The Director of Civil Aviation decided to suspend the aircraft certificate of airworthiness until such time as an inspection had been completed and to suspend the Air Operator's Certificate while the root causes were being investigated. Although this CAA investigation was completed within a couple of weeks, FlyStark management elected to extend their operational suspension until they were fully satisfied that they were ready to recommence safe air transport operations." The owner of FlyStark felt the compnay was under such scrutiny that he decided to wind down and end operations. As a result in September 2017 the second of the two Airvans, ZK-FSS, was sold. Scheduled summer services did resume in December 2017 with a daily service offered leaving Ardmore at 11.00am for Great Barrier Island and then Whitianga. The return service departs Whitianga at 2.00pm. These services operated infrequently and did not last beyond the summer. The company continued to operate occassional charters until their remaining Airvan ZK-FSR was sold in August 2018. I wondered what had happened to NPJ after the demise of NPAC. I did my PPL flight test in her in 2007.